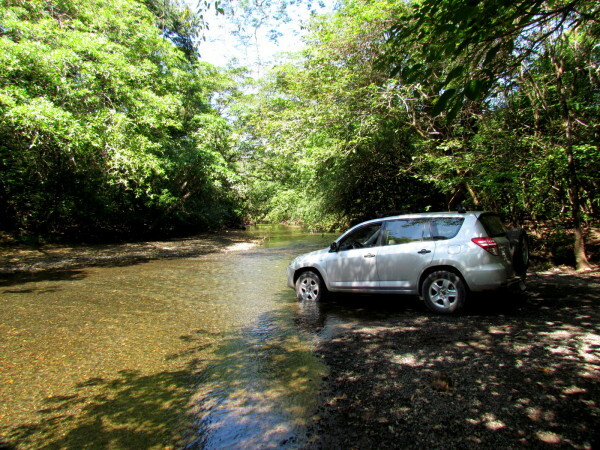 It won’t be too long before all the fords are replaced by bridges on the Nicoya Peninsula. There’s an unpaved road that runs the length of the Pacific coast of the Nicoya peninsula but it’s not always passable. In May or June through November vehicles may not be able to cross some of the rain swollen rivers and have to turn inland to the paved route 21 to go north or south then head back to the coast turning a ten minute dry season drive into a three or four hour detour. The pavement is encroaching on the wilderness and there are about 70 km more asphalt roads and two major bridges that weren’t there a decade ago (we make maps remember). If you want the off road experience you should go soon because it won’t be too long before they’ve paved paradise (and put up some all inclusive resorts as well as parking lots). You can drive on a paved road to many of the Nicoya beaches, but many may be a little too far from an international airport if you’re taking a short trip. Costa Rica’s Nicoya peninsula has more dry, hot sunny beach weather than anywhere else in the country and it’s evolved a different kind of forest. Here, during the dry season, many of the trees drop their leaves and the landscape can look more like a desert than a jungle. On the very southern tip of the peninsula at Cabo Blanco the transition to a wetter ecozone begins, but to really experience the rainforest you should head to the mainland. Many people also ask us if they can visit Monteverde cloud forest on a one day tour but the distance and rugged road for the last hour or so put it out of reach. To experience the cloud forest from the Nicoya beaches it’s strongly advised to book at least one night’s stay in a Monteverde mountain lodge. There are no rafting rivers on the Nicoya peninsula and while there are a few zip-lines you need to head to the central mountain or volcano regions for the really big air. There are a couple of medium sized resorts in the mouth of the Gulf of Nicoya but nothing along the Pacific side and on the scale of the international properties up north by the international airport and Papagayo gulf. Barcelo Los Delfines and Tango Mar are located at Tambor near the airstrip and ferry terminal from Puntareans and fit better in a group with the hotels on the mainland than with the properties on the Nicoya Peninsula.